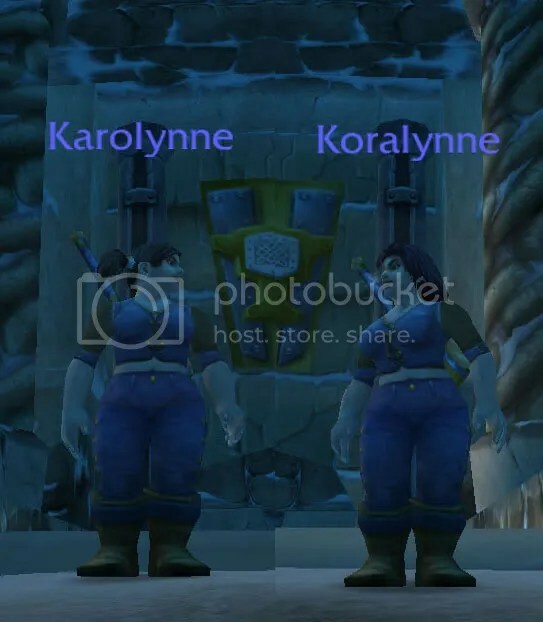 Once upon a time, twin girls were born in Ironforge. Although they looked identical, they had very different personalities. Karolynne struggled to learn things in the disciplined setting of a classroom, but thrived on discovering things by her own independent exploration and experimentation. Koralynne excelled at lessons and studying, but lacked her sister’s spark of curiosity and creativity. Karolynne hoarded all the money that she was able to earn and was reluctant to spend even a single copper, but she loved to receive presents and prizes. Koralynne prided herself on making do with only the things that she could purchase out of her own funds, and was uncomfortable with gifts and rewards. As they matured from children into young adults, these traits became so pronounced that their friends began to laughingly call them “Thrifty-lynne” and “Iron-lynne”. After King Magni’s tragic accident and Princess Moira’s lockdown of Ironforge, the Chiselspark sisters realized that they had never been out of The Mountain in their lives. Sure, they’d picnicked on the slopes from time to time, but that didn’t really count. Furthermore, Karol discovered that she was intensely curious about the Dark Irons, and Koral found that she wanted to study the intriguing traditions of the Wildhammer Clan. Of all the people they had watched passing through Ironforge over the years, there were none they admired more than the holy warriors of the Order of the Silver Hand Argent Dawn Argent Crusade. Each lass had, in her own way, sought out and been touched by the power of the Light. And so, shouldering the maces of newly initiated Paladins, Thrifty-lynne and Iron-lynne left their family’s home in Ironforge and set out to help the good folk of Coldridge Valley with the ever-present menaces of Troggs and Trolls. Karolynne will be a Thrifty leveler. She *can’t* use trained abilities, but CAN use talented abilities. She will get all of her gear from quest rewards and drops. Koralynne will be an Ironman leveler. She CAN use trained abilities, but *can’t* use talented abilities. She will get almost all of her gear from vendors, because she can only use grey/white quality drops. I have enough other WoW projects going, however, that it may be awhile before I put in any serious playtime with these lasses. Hehe – love it!! Will be really interesting following these two on their adventures. Great that you made them twins and both of the same class. That should give you a really good insight into their strengths and weaknesses, especially if they follow the same quest chains as well. Very very interesting! And I loved the back story 🙂 Really good luck! Wow, you are a glutton for punishment! I keep thinking I want to do an Ironman toon, but I’m not sure I could stomach it! Challenge leveling I think is maybe not my cup of tea. I’m just a suicidal serial pugger. Oooh… I’d love to see this story unfold! on January 30, 2012 at 9:09 pm WoW: The Ironman Challenge « It's For My RP Spec!